HAVANA — The business ideas have ranged from a bikini franchise to a peanut farm, restaurants, and design firms for software and home interiors. But even more novel than the pitches — in a country where entrepreneurship used to be illegal — is the financial muscle behind them: Cuban-Americans whose families lost their previous ventures to Cuba’s Communist government. Many of the first Cubans to leave after Fidel Castro took over are beginning to come back, reuniting with the island they left in bitterness and anger, overcoming decades of heated opposition to its leaders, and partnering with Cubans in direct, new ways. It has been a shocking reversal for a community of exiles that has long represented a pillar of support for the American embargo against Cuba. And though the activity is legal through humanitarian or other licensed exceptions to the sanctions, some Cuban-American lawmakers have responded with outrage. Representative Mario Diaz-Balart, a Republican from Miami, called Mr. Fanjul’s trips a betrayal. But what has emerged in Miami, New York and elsewhere over the past two years, as President Raúl Castro has opened the economy, just a crack, is an alternative approach that emphasizes grass-roots engagement, often through churches, as a tool for giving Cubans skills and independence from the state. Among many Cuban-Americans who now describe themselves as a part of a diaspora, rather than exiles, a new sense of responsibility — to Cubans on the island, not to the property they lost or to fighting the Castros — has gathered strength. The expanding exchange of people, ideas and money is a result of policy changes over the past few years in Washington and Havana that have opened up travel and giving for Cubans and Cuban-Americans. After decades of being cut off by politics, the airport here is always crammed with Cuban-Americans coming to see family and lugging in gifts, just as it is now more common to see Cuban artists, academics and dissidents in Florida or New York, often mingling with the established Cuban-American elite. For many families, the transition from keeping Cuba at a distance to pulling it close has taken time and multigenerational discussion. When Kevin O’Brien and some of his cousins decided a few years ago to take charge of the long-dormant Bacardi Family Foundation, they agreed to focus much of their support on Cuba, returning to a version of an old family custom: Relatives pool money together and distribute it to a chosen cause or person. Not everyone gives; there are about 500 Bacardis now, and disagreements over the homeland are common, said Mr. O’Brien, the foundation’s president. But since reactivating the foundation in 2012, the Bacardis have raised $28,000 for water filters after Hurricane Sandy and financed efforts to encourage creative expression, with art, photography and music. Cuban officials seem tolerant, to a point. Eager to improve their weak economy, they welcome the money but fear its power, said one artist supported by the foundation who spoke on the condition of anonymity to avoid reprisals. He added that while Cuba’s leaders had become more welcoming — no longer calling exiles gusanos, or worms — they were still distrustful, determined to keep Cuban-American influence from becoming an immediate challenge to the state. For now, experts say that seems unlikely. The organized money going to Cuba, beyond an estimated $2.6 billion in family remittances, mostly from the United States, remains relatively small. A lot of it is still funneled into the Catholic Church, one of the few institutions allowed to play a role in civil society. The Order of Malta provided 800,000 meals for the elderly in Cuba last year with around $250,000 in donations, mostly from Cuban-Americans in Miami. The Cuban police nonetheless interrogated some of the old women being fed. The Cuba Emprende Foundation, a nonprofit on which Mr. Mestre is a board member, has also struggled to reassure Cuban officials that its founders — a bipartisan mix of exiles long dedicated to engagement and others who only recently embraced the idea — are interested only in incubating small businesses, in line with the government’s stated economic policy. The organization’s official tax forms filed recently with the I.R.S. state that it has disbursed about $225,000 so far, none of it from the United States government. 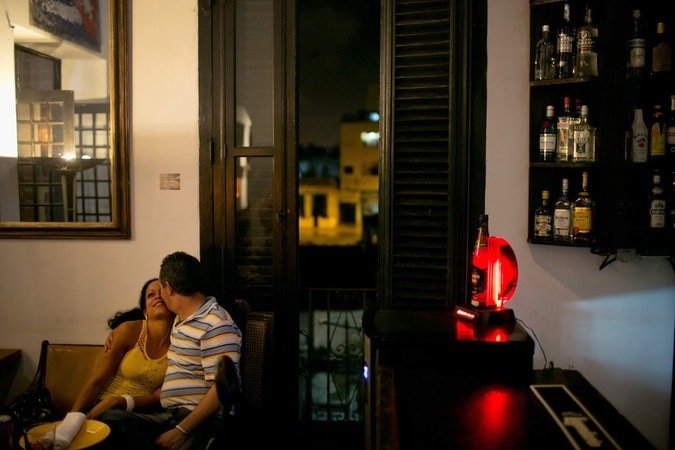 Board members say that Cuban officials suggest that Cuba Emprende must be part of a covert Washington plot. A Cuban instructor in Havana, who spoke anonymously to protect the program, said the pressure had increased as Cuba Emprende grew; by mid-March, 731 graduates will have completed the 80-hour course, run through the church in an old seminary here and at a rectory in Camaguey. Cuban-American lawmakers who back the embargo also seem displeased with the increased engagement, even though Cuba Emprende and other groups in Cuba emphasize that their work does not violate the embargo. Senator Robert Menendez of New Jersey, the Cuban-American Democrat often described by administration officials as Washington’s main impediment to broader changes in Cuba policy, said it was simply ineffective. “I’m not seeing this engagement produce the results they say it would,” he said, adding that “the regime hasn’t become more open,” even as Europeans travel and invest in Cuba, unfettered. That bond is now evolving alongside, or within, Mr. Castro’s limited opening to market ideas. Ms. Higueras, a whirlwind who had always dreamed of opening a restaurant, now owns Atelier, one of Havana’s most popular eateries. Cuba Emprende played a major role in making it happen. “Everything in that course was important,” she said, including how to calculate her books or change her menu for the slow season. She said she also benefited from the sense of a shared mission with her classmates and the accountants and other professionals Cuba Emprende relies on for help in Cuba. “There was just such chemistry,” she said. Now, in her business and others, there is a demand for more opportunity, more possibility — but also the usual barriers. Cuban law and the American embargo prohibit Cuba Emprende from bankrolling its students’ ideas as it would like to. Without enough capital for bigger ventures, including Ms. Higuera’s dream of a cooking school, some ambitions are just visions.